Last night was the Grace Church building dedication service. What an awesome time of fun, worship, memories and fellowship. Doug put together an amazing video that walked through the history of Grace Church while the band played "How Great is Our God". Special thanks to Brad and Real Media for helping Doug out by donating tools and creating that cool new logo animation. It's SWEET! The video went way beyond what I expected. When the lights came up after the song I could see several people wiping away tears. I knew during our rehearsal that I was not going to be able to keep myself composed if I looked up at the video while singing the song. After the lights came up...that was it! I lost it! It has been a journey I'm so glad to have been a part of. But really, this is just the beginning for Grace. For great video and marketing needs, check out Real Media. 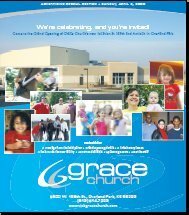 On Palm Sunday, April 9th, the Kansas City Star ran a six page ad on the Grace Church move. It included a note from our pastor, Tim Howey, and some details about ministries, history of Grace and gobs of ads from the companies that worked with us to get the building done. I don't know how many papers across the country offer this kind of advertising but if you're involved in a building project, it's definitely worth the investment. With a little legwork on our part through providing the companies we typically do business with (construction, AVL, food etc.) they contacted each vendor and asked if they would like to be involved with an ad for our move. Great idea! The paper went to 50,000 customers in our area. We've received some email queries through the ad. Our real return on the investment will be this Sunday. We're hoping to really reach roughly 1000 people over the weekend. Head on over to Doug's site for more pics of our first service here. Just a quick post for now. Everything went amazingly well. We stayed up until 1:30am or was it 2:30am Sunday morning because of the time change? For a quick peak at the stage, have a look at our video man's site over at Howecogitate. Click here for his "View from the Booth". Now That's a Sound Booth! That little head in the center is Scott our audio lead. The other head on the right side is our lighting lead, Keith. This is a monster booth. Our audio, video and lighting team will be swallowed up in this bunker. One thing is for sure, they will no longer have to deal with being distracted by passerbys during the service. Click the pic to enlarge if you'd like. These guys are working hard. CSD is doing a great job installing the AVL. We're currently having issues with getting electricity run and may not be able to use our new audio system this Sunday. We'll see what happens by days end tomorrow. Here's a shot I just took of the stage. You can click the images to enlarge. We have officially moved ALL of Grace Church to the new building. Everything from Blue Valley Middle School and from two storage facilities is now under one roof. Now, just like any new home, it's time to unpack and put everything together. Let me tell you about the people of Grace Church. I've NEVER seen anything like what I saw tonight. There were so many people that helped move tonight that all I set my hands on at the school was a foam pad and a notebook. Seriously, I got there five minutes late and no kidding, everything was already loaded into trucks. It was the fastest move I've ever witnessed. The people of Grace are amazing! Now comes the next phase...getting ready for the first weekend. The speakers and lights came today along with the installation crew. Hoping that we'll have everything ready for this Sunday but anticipate having to use our old system this weekend. We'll see what happens. It's 7p.m. right now and the crew are still at it and have been since 10a.m. today. The first speaker is up!